In 1869, St Julian's Priory was founded on Steyning Road, to the north-east of West Grinstead, West Sussex. On 28th April, 1874, a Certified School was opened at the site, known as St Mary's Home for the Maintenance and Education of Orphan or Destitute Girls. The Home ceased operatimg as a Certified School in 1889. In 1879, a Home, School and Orphanage for Roman Catholic Boys was also opened at the site by the Southwark Catholic Rescue Society. In 1893, a large new building was erected to house the convent and orphanage. The convent, now known as St Dominic's Priory, had fifty cells. The orphanage could now accommodate up to 185 boys aged from 4 to 12 years, with a payment of £13 a year required. Applicants had to provide a certificate of baptism, a medical certificate, and a recommendation of a priest or responsible person. Carpentering, tailoring and gardening were taught. By 1903, the orphanage was known as St Joseph's, and from 1909 as St Mary's. It closed in around 1932 and the boys transferred to Gravesend. The West Grinstead site is shown on the 1909 map below. 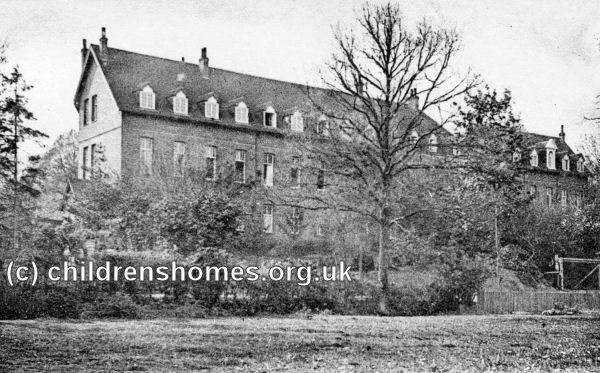 St Mary's Orphanage for Girls site, West Grinstead, c.1909. In November 1935, the premises became home to the St Thomas More Approved School for Roman Catholic Boys. The establishment, still managed by the Southwark Catholic Rescue Society, was run by the Presentation Brothers. It could accommodate 120 boys under the age of 13 at their date of admission. Its capacity was later reduced to 86 places. In 1973, the School became a Community Home with Education (CHE) in conjunction with Southwark London Borough Council. The Presentation Brothers withdrew from the School in 1977 and it was run by lay staff until its final closure in 1984. Most of the original buildings have now been demolished and the site is covered by modern housing. The National Archives, Kew, Richmond, Surrey, TW9 4DU. Has various reports and other documents. West Sussex Record Office, County Hall, Chichester, West Sussex PO19 1RN. Has some accounts and a few other documents relating to the School.